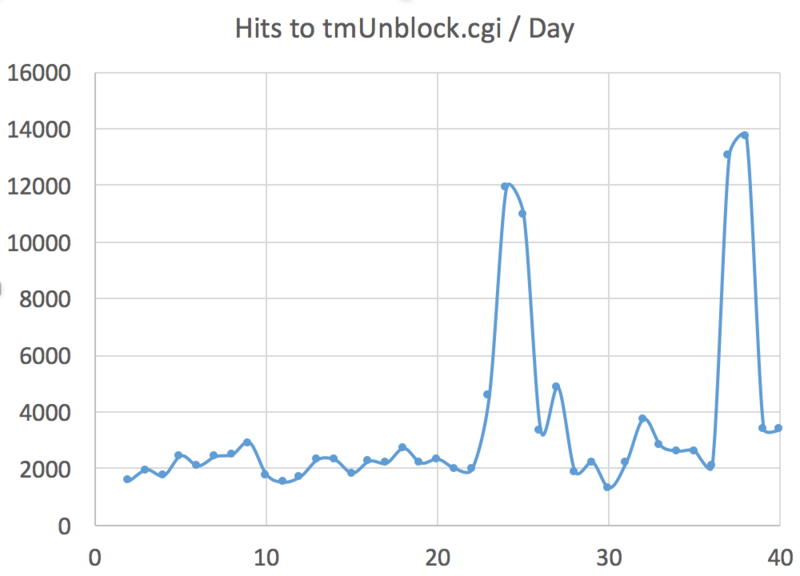 27.100.64.102 - - [04/Aug/2015:10:03:44 +0000] "GET /tmUnblock.cgi HTTP/1.1" 200 195 "-" "-"
27.100.64.102 - - [04/Aug/2015:10:03:45 +0000] "POST /tmUnblock.cgi HTTP/1.1" 200 195 "-" "-"
So looks like the attacker is "securing" the router by blocking access to the web based admin (port 80, 8080) and allowing access from very specific IP addresses, probably controlled by the attacker. Virustotal identifies ".nttpd" and ".sox" as a proxy (Avast, DrWeb) . Reports for these binaries go back a few months. The scripts also appear to modify name servers in resolv.conf, but so far I think they only set them to Google's name servers (8.8.8.8 and 8.8.4.4). FWIW: per whois, 109.206.177.16, belongs to Serverel, a California company (but it is RIPE IP address space). abuse@serverel.com was notified. Severel shut down the affected server shortly after being notified.